← B … Log ? Einstein missed the Golden Ratio and ended making explosions not implosions ! Therefore scaring us about the nature of the Universe and us. Implosions. Some call it the Perrenial Philosophy, some call it Mysticism, but not many say that it can be applied. Not many say that this technology can help us produce Hydrogen for a clean energy economy, or medicine, or even architecture and rockets. The Ancients knew about this technology. Stone Henge was built to facilitate crop growth and life extension (read: your health is better). So why are we missing this ? Or are we ? Take a look at the latest Science magazine covers. Nature and New Scientist have articles about the latest Fractal based physics. Fractals. Not something just to put up as a poster in the 90’s and then throw out when fractals have gone “out of fashion”. They are now being applied ! This is the dream of Buckminster Fuller becoming a reality. It is “Star Trek Physics”, it is Geordie in engineering trying to to work out some practicalities. It is not “New Age Escapism” or “misguided”, or even “fantasy”. This is real, and a very real way of helping .. yes, us poor people on Planet Earth ! There are answers. There is a way through the nightmare here. It’s time we wake up from it, wipe the sweat off, and make a coffee in a brand new morning. 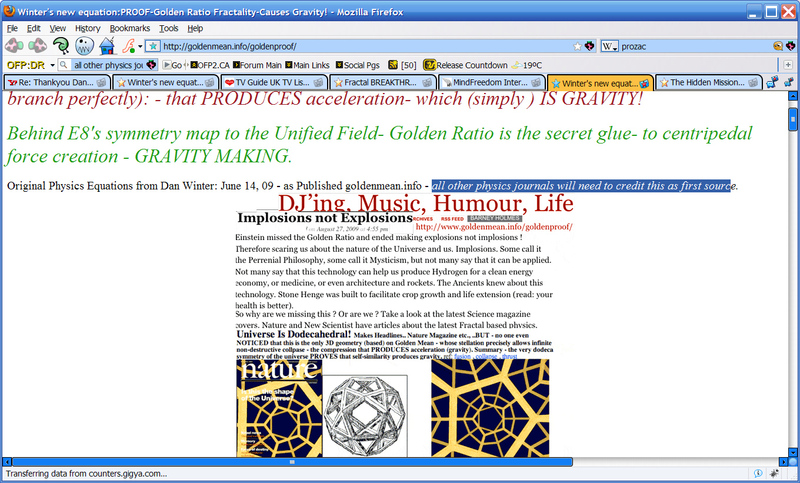 EDIT: Thanks to Dan Winter for including this page on the page I cite (could that be considered some kind of fractal embedding?) …. glad to be of help.